More than 10.000 visitors came to see the Concours of America at the new venue at the Inn at St. John's in Plymouth after decades at Meadow Brook Hall. And what a difference it made! The new space allowed for no less than 331 cars to be displayed on the generous field in almost two dozen classes. 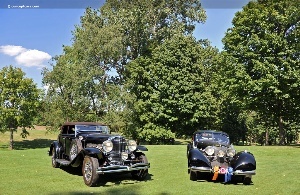 The well deserved winners of the first of many Concours' of America at St. John's were John D. Groendyke, who won 'Best of Show Domestic' with his fabulous 1933 Duesenberg SJ and well-known collectors Arturo and Deborah Keller with their breathtaking black 1938 Mercedes-Benz 540 K Autobahnkurier, which was awarded the honors of 'Best of Show Foreign'. in June of 1934 by Lt. Col. Jacob Schick of razor fame, it boasts an ingenious roof design that was sleek and elegant compared with many contemporary solutions. The 420 cu.in inline-eight-cylinder-engine of this car delivered no less than 320hp – in 1933 an almost unbelievable number. Restored in the early 2000's by multiple Best-of-Show-winning restorer Fran Roxas, the complete 'nut and bolt' restoration involved every techanical component either being rebuilt or refurbished as necessary. The award at the Concours of America reflects the effort being put into this car as well as the uniqueness of its design, history and technical specification. Deborah Keller, however, is an even more unique style exercise from the aerodynamic decade of the 1930's. The imposing 1938 Mercedes-Benz 540 K Autobahnkurier, as the name suggests, was intended, for the very select few to cruise at unheard-of speeds on the newly created German Autobahns. Low-slung, with an almost seductive, tapered rear-end, the car is rumored to have inspired Jean Bugatti to create the legendary Atlantic. Powered by a 5.4 liter inline-eight cylinder with a super-charger delivering 180 hp, this aerodynamic pioneer was capable of speeds in excess of 115 mph. This car was built new for Spanish Professor Ignacio Barraquer in 1938 and remained in the Barraquer family for almost 70 years, until Keller acquired it in 2004 and commissioned a full restoration by noted Mercedes experts Paul Russell & Co. This year was the inaugural Concours d'Elegance of America at St. John's, formerly known as the Meadow Brook Concours d'Elegance. Along with the name change was the move to a new location at St John's in Plymouth, Michigan. Located between Detroit and Ann Arbor, St. Johns is a former Catholic Seminary that has modified into a luxurious convention center with on-site hotel and plenty of meeting space. The new location is ideal for this world class concours event and its related events. Like Meadow Brook, it too is surrounded by a golf course which serves as the show field for the 300+ classic cars. The events begin on Friday with a historic race at the 2-mile, high-speed oval at Michigan International Speedway in Brooklyn, MI. There is a motoring tour, a VIP tour of the new automotive exhibit at The Henry Ford Museum in Dearborn and a Welcome Reception for the RM Auction. Saturday events included an open house at the American Speed Company, a Car Valuation Seminar presented by Hagerty Insurance Company staff, a Design Seminar focused on Chuck Jordon's influence on GM, and a tour of Roger Penske's Ilmor Engineering race car shop. RM Auctions held their first auction at the new location, realizing $7.6 million in sales with a 1932 Packard Twin Six earning the top sale of $1.1 million. The highlight of the event was the 1939 Pontiac Plexiglas Deluxe Six ‘Ghost Car', America's first full-sized transparent car and a highlight of the 1939-40 New York World's Fair, which sold for $308K. The concours was held on Sunday and featured over 300 vehicles in over 30 classes. Features included the 100 years of Indy Cars, the First 125 Years of Mercedes-Benz, and the 100 Years of Chevrolet. There were classes for Duesenbergs Model A, X, and J models, a tribute to the Lincoln marque, and an Auburn V-12 category which housed five cars (all from the same collection) and wearing the same paint color scheme. In the Continental group were three cars (all owned by the same care taker) that were once owned by the Ford brothers (Benson, Henry Ford II, and William Clay Ford). Another interesting, well curated, and creative categories was the 'Color & Chrome' group, which housed cars from the 1950s had were finished in vibrant and eye-catching colors. In the Indy Car category included 100 years of Indy Cars highlighted by the Miller which won the race in 1923. In total, there were over 30 vehicles that spanned from the early 1910s to the late 1980s. After over three decades at the Meadow Brook Hall, the move to a new location was understandability a difficult decision to make. The new venue proved to be a worthy location with plenty of space, conference centers, meeting spaces, and hotel rooms to accommodate all the activites of this world class event. The car selection committee did an exceptional job at filling each of the categories with excellent examples of automotive history. From brass era cars to modern supercars, the list was extensive and educational.